Travel is strenuous under the best of circumstances which is why we are always on the lookout for outstanding products. I have not personally tested any of these but they were voted winners by the pros who design, manufacturer and order travel gear for us to purchase. Here, then, are the winners of the 2013 Travel Goods Association show's Product Innovation. Travelpro's Platinum Magna luxury collection. The Awards Committee selected the collection for its MagnaTrac self-aligning wheel system. When Platinum Magna is pushed, magnets instantly align the wheels to roll straight in the direction you want to go. Most spinner luggage drifts or pulls to one side or the other, putting strain on shoulder, arm, wrist and hand. Platinum Magna tracks effortlessly in all directions. The Platinum Magna 21" Spinner's MSRP is $640. Rimowa's new ONYX 13" Laptop Bag. Weighing in at less than 3 pounds, the case is extremely lightweight yet tremendously versatile. Made from RIMOWA's signature 100% virgin German polycarbonate, the case is equipped to protect valuable contents in its interior, such as laptops and tablets. It also includes protective front and back pockets for convenient access to travel documents, notes or personal items. The case will debut later in 2013; the MSRP is still to be determined. Delsey's Helium Aero International Carry-on Expandable Trolley. The carry-on boasts a hardside exterior pocket, and is one of the few hardside collections that expands two inches, offering added packing space when needed, and also features a hardside, exterior front pocket - something previously lacking in hardside luggage. The large, easy-access pocket opens all the way to the bottom of the case and conveniently stores computers, electronics, tickets, documents, or toiletries and other items travelers may wish to retrieve during their trip, and boasts a padded sleeve. Its MSRP is $179.99. The Travel Halo travel pillow. Made to be worn as a halo around the crown of the head, the pillow's innovative design holds travelers' heads in place with two small cushions on the back of the head. It also offers a built-in, roll-down eye mask that comes down to shield travelers' eyes from light. The Travel Halo's MSRP is $29.99. Quebec City from above. Photo © by Judy Wells. 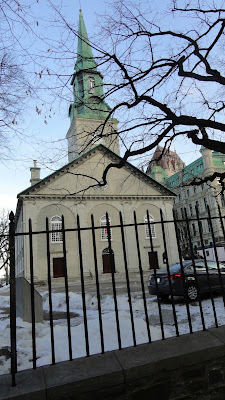 Quebec City is too pretty, its buildings too interesting, the views too photo-worthy to go underground as one can in Montreal. You don't want to miss a block of its well-documented charm which can be a challenge for Levelers in winter. Warning: I was there in February and if the temperature ever went below freezing, it was only to produce new patches of ice. Walking and gawking is out of the question; you will hit ice and you will fall. Still, there's something magical about a city swathed in snow and if nothing else, icy patches make you stop, allowing closer looks and a greater appreciation of what you're seeing. 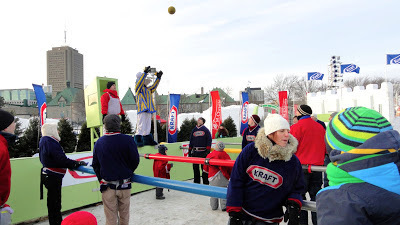 The city climbs from a small, level stretch along the St. Lawrence River where it all began to a ridge dominated by the Chateau Frontenac Hotel then up to Parliament and the Plain of Abraham, home of the annual Winter Carnival, the largest. Views from the river are stunning and it's easy to see why the Frontenac is called the world's most photographed hotel. Overviews of the city from the top are equally stunning. I stayed at the Hilton where the views down are spectacular. The only problem: they are so good that as considering the cold and ice outside you might be tempted to spend the day in your room looking out. What a shame that would be with the fascinating places to see and delicious spots to eat. Winter Carnival. It's a daunting prospect for Levelers, an event celebrating the snow and ice of winter set in snow and ice, but if you're in town while it's running, don't miss it, especially the special events. 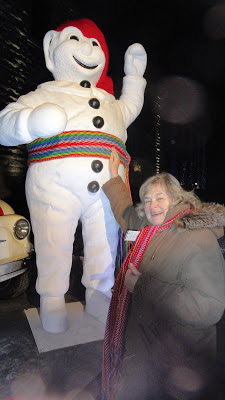 Bonhomme, a giant white, sash, cap sunglass-wearing and much beloved mascot, reigns over all. Another human foosball game begins. Photo © by Judy Wells. 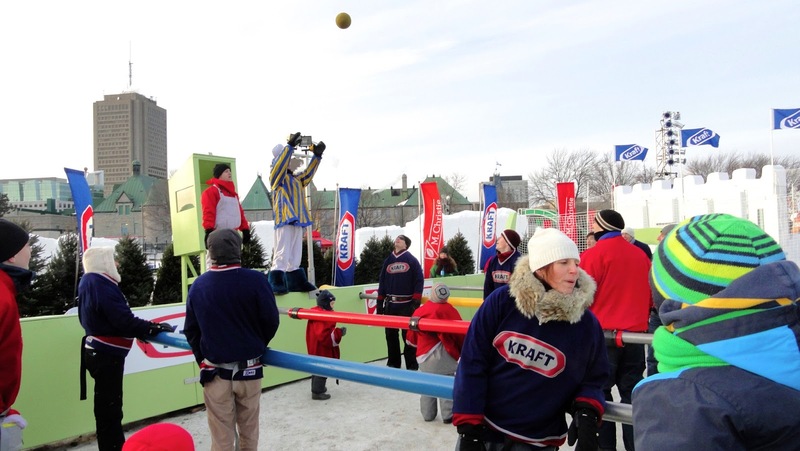 The carnival itself has the small-town, almost provincial feel of a fair with its ice carving contests, human foosball games, children's activities, a ferris wheel and sledding run. Get your caribou outside on inside. Photo © by Judy Wells. There are food booths and leave it to the French to include adult beverages in the mix. The Bistro tent is always popular, especially the toe-warming Caribou (recipe at my Food Afar - Recipes from a Travel Writer blog, http://www.foodafar.blogspot.com/2013/02/quebec-citys-bonhomme-caribou.html). Hot tubs were popular day and night at Winter Carnival. Photo © by Judy Wells. Oddly, equally popular are the hot tubs. 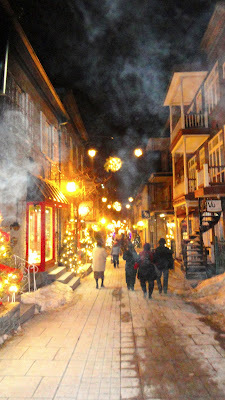 Quebecois really dig winter! Warning: At night it turns into a dance party, but I wouldn't recommend this; too much ice, too little lighting. Go in the daytime. An ice canoe racing team practices in the St. Lawrence River. Photo © by Judy Wells. 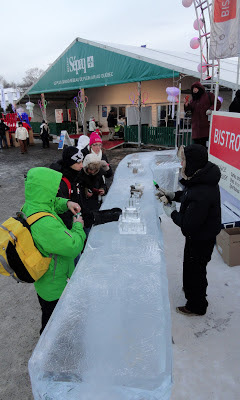 The special events - canoe racing across a partially frozen river, night parades and creative light shows, racing horses pulling skiers around a course of challenges - are about as special as you can get. Tip: Worth pushing yourself to see, Levelers. 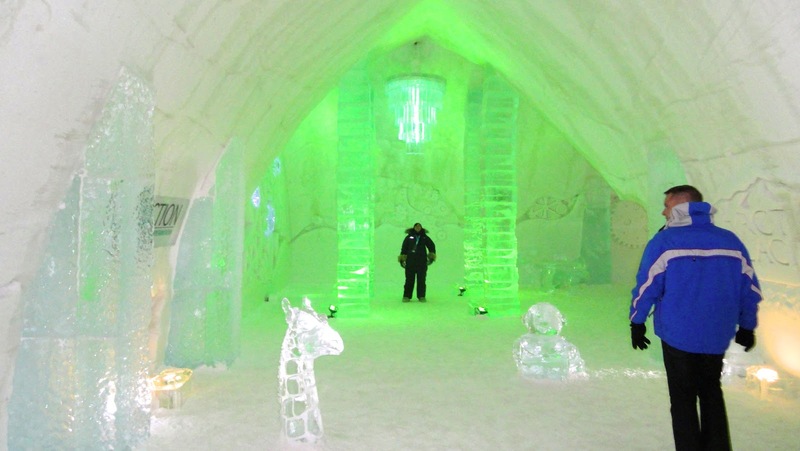 Tour the Hotel de Glace. Photo © by Judy Wells. Tour of the Hotel de Glace, where those who care more for unique experiences than creature comforts an spend the night. 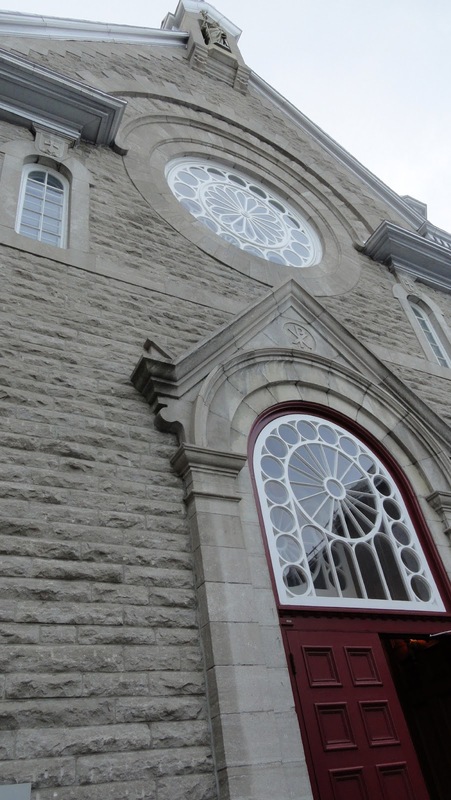 Anglican Church of the Holy Trinity. Photo © by Judy Wells. Check out the churches. The first Anglican cathedral built outside the British Isles, Anglican Cathedral of the Holy Trinity, is modeled after London's St.-Martin-in-the-Fields thanks to the largess of King George III (the one who lost the colonies and was profiled in "The Madness of King George"). King George III gave the silver service and part of the coronation robe off his back to the Anglican Cathedral. Photo © by Judy Wells. 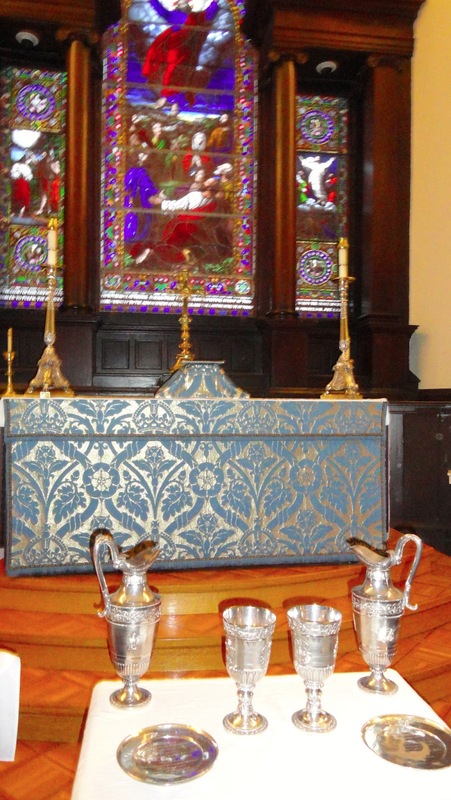 The pews were made of wood from the Royal Windsor Forest, the silver was a gift from the king and the altar cloth is from his coronation robes. Ursuline Chapel. Photo © by Judy Wells. Museum of Ursuline Sisters is considered one of the finest examples of convent architecture in North America and contains items from the oldest teaching community in the country. David Mendel of Mendel Tours, an expert on Quebec City history, gives a fascinating and informative tour. The Inuit art will win you over at the fine arts museum. Photo © by Judy Wells. Don't miss the art. The Musee national des beaux-arts du Quebec has a comprehensive collection of Quebec artists, including a room of superb Inuit art and another of Jean-Paul Riopelle. Best of all, pull open the drawers in the many cabinets scattered about and you'll discover a treasure trove of works on paper that enhance the work on display. The Restaurant du Musee will keep hungry gourmets happy, too. Tip: There are stairs but there are elevators too. Old town is magical at night; just watch out for the ice. Photo © by Judy Wells. Wander through the city. Begin at the bottom. Some shops can be a bit touristy but most aren't and it's like a fairyland at night. Again, watch the ice. Quebec City from the ferry. Photo © by Judy Wells. While you're at the river, hop aboard the ferry. Tip: There are 22 steps up to the ferry. Get that Titanic feeling aboard the ferry. Photo © by Judy Wells. There's really nothing to see or do on the other side but the views of Quebec City are grand and motoring through the ice will give you a Titanic moment. Tip: Stairs are unavoidable as are hills in the old city. Lots of good places to stop and catch your breath while you leche le vitrine, "lick the windows," the quebecoise way to say window shop. 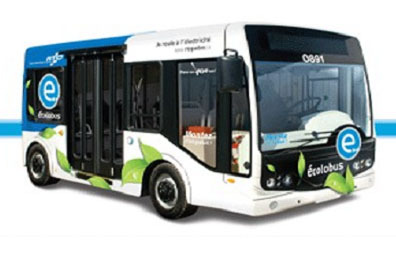 The ecolobus, an electric minibus designed for accessibility, travels through the city from ferry to Chateau Frontenac to Parliament levels. Fare is 2$ (Canadian) and exact change is required. You'll be hard-pressed to find a bad meal in Quebec City. A good place for croissants and more. Photo © by Judy Wells. Le Petit Cochon Dingue (crazy pig) is a bakery/eatery known for its pastries and breakfasts. Warning: At the one across from the ferry, you will have to negotiate stairs to go from counter to dining area. Le Graffiti on Cartier Avenue, produced the best meal I had with a fine touch for flavor and an excellent wine list. Worth a splurge. Savini Resto-Bar is a very popular, sophisticated wine bar and Italian restaurant. Upstairs is quieter than the bar area. Beavers everywhere at Beaver Tails. Photo © by Judy Wells. Beaver Tails. 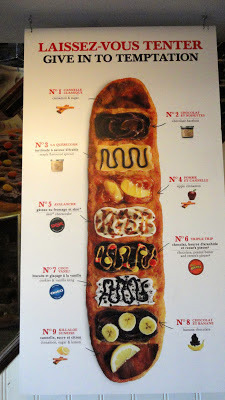 You can get this whole-wheat pastry at Carnival, but I'd prefer the shop just a few doors from Le Petit Cochon Dengue. 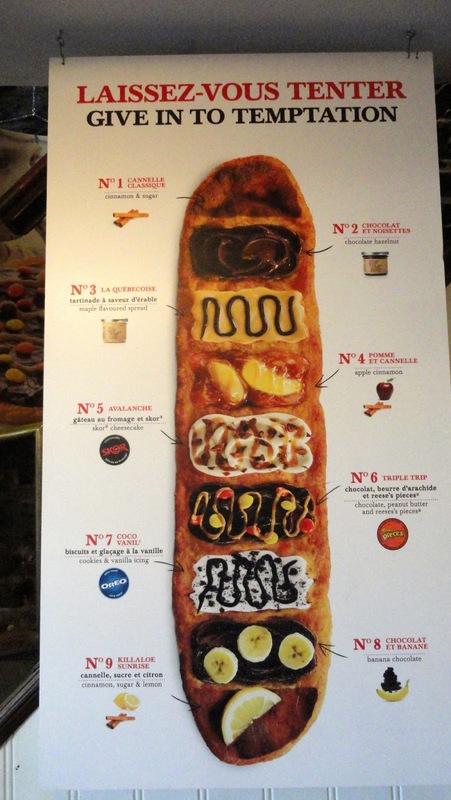 They make them fresh with your order, stretching the beaver tail-shaped pastry, frying, then adding butter and your choice of flavors - fresh bananas, chocolate, maple cream, whatever. It's a Canadian tradition favored by President Obama, Hillary Clinton and the musicians of Bare Naked Ladies.